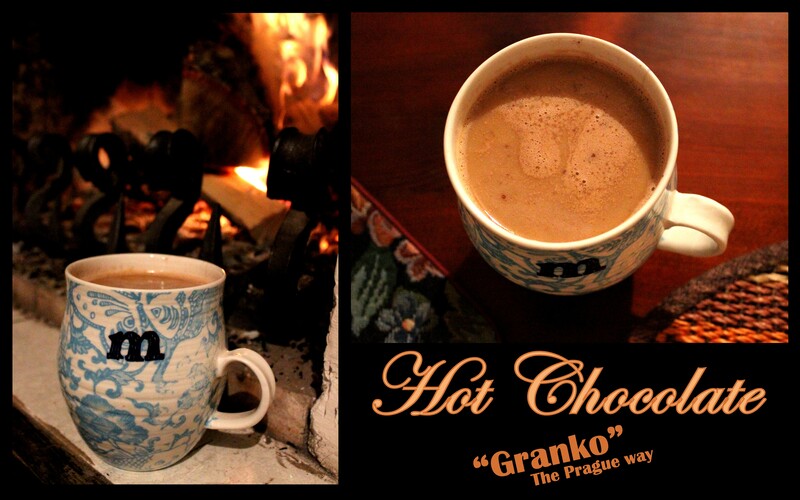 This is a ‘how-to’ post about the best cup of hot chocolate ever. Good hot chocolate is kind of an essential in our line of work (that being the occupation of existing as a human). Definitely this time of year, when days are short and brisk and nights are long and cold, hot chocolate is the cure to a number of ailments, including but not limited to: homesickness, stress, hunger, boredom and the intense desire to Google search South American human sacrificial rituals (because, you know, everyone’s had that urge at least once). I’m currently reading a fascinating book about the 150 year battle between early chocolate developers in Europe in the 19th century. It was originally sold only in liquid form, generally without sweeteners and heavily infused with potato flour, red lead and brick powder. Needless to say, things have improved. Now, I’m pretty sure this recipe works with any kind of chocolate powder, but the chocolate of choice here in Prague is a mix called “Granko.” It’s sold in a bright blue box with bold red and yellow lettering so that anyone unfamiliar with the nature of the product may just confuse it for a drain cleaner or dishwashing soap. But it’s not. It’s a miracle in a cardboard box. I brought some into school one day to make hot chocolate for the students in my afternoon book club. After we had gone through all the hot water, the kids starting eating the powder straight from the box by the handful. I’m not sure if that has more to do with the nature of eighth graders or the quality of the product, but it’s no shameful endorsement in either case. So here’s how to make this delightful cup of joy. Pick your cup of choice. When it comes to picking mugs for chocolate there are only two criteria – size and decoration. Size is obvious – the bigger the better, duh. The decoration is important because if you’re drinking from that mug you picked up at a conference from that job you were recently let go from, the contents inside your cup will sense the tension and the frothiness of your drink will melt away in morbid depression and pity. I suggest picking a mug with kittens or christmas reindeer. Pour one tablespoon of water into the cup and fill the rest with milk. Then pour mixture into a saucepan and bring to a boil. Add half a tablespoon of butter to the milk just as it comes to a boil. If you want to add more butter, no one on this side of my computer screen will judge you. Add half a teaspoon of cinnamon and take off heat. Pour frothy milk into your mug of choice. If that nasty layer of coagulated milk appears, do not let it inside of your mug. It is to your happiness what dementors are to Harry Potters’. Add three (or more, or less – but only if you’re super lame) tablespoons of Granko and stir. The oil bubbles from the butter should be clinging to the edges like little fairy pools. Don’t let your cholesterol levels panic. You are in charge here. Let cool for three minutes so that you don’t ruin the experience with burnt taste buds, and then enjoy! My friend Philip is quite the cook and upon my last visit, the idea was suggested that we make jam. I have never made jam and only know (from that chapter in Little Women where Meg makes a huge mess and then cries) that it seems difficult. Naturally, I was excited by the challenge. 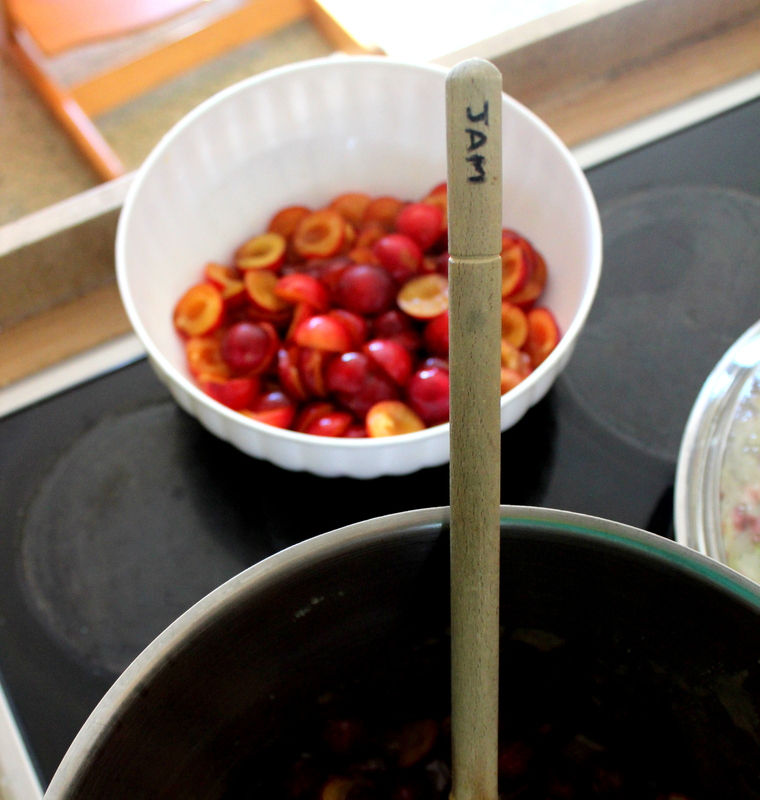 The jam we were making comes from špendlíky which means “pins” in English. I have never seen this fruit in the USA and have no idea what we’d actually call it. But they look like very small apricots or biggish cherries and are either yellow or red. Let me preface this by reminding everyone that my ability to put things together in any effective capacity in the kitchen is on the limited side. Also, there was a very cute kitten in the kitchen while we were working on this project so… I may have gotten a little distracted. Prepare your space – Clear counters and wipe down tables so you have room to cut fruit, etc. Put on an apron, wash hands, etc. Cut and pit špendlíky – slice the fruit down the middle and twist the sides to reveal the pit (like twisting an Oreo to get to the cream filling). Drop the pit in one bowl and the meat of the špendlíky in the other. 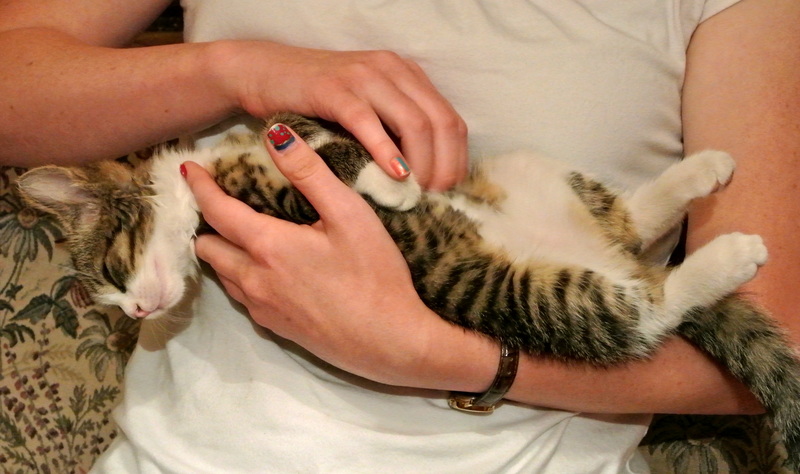 Wash your hands again because you pet the kitten and its hair is sticking to your juicy hands. Also wash the knife and anything that has come within close proximity of said kitten. 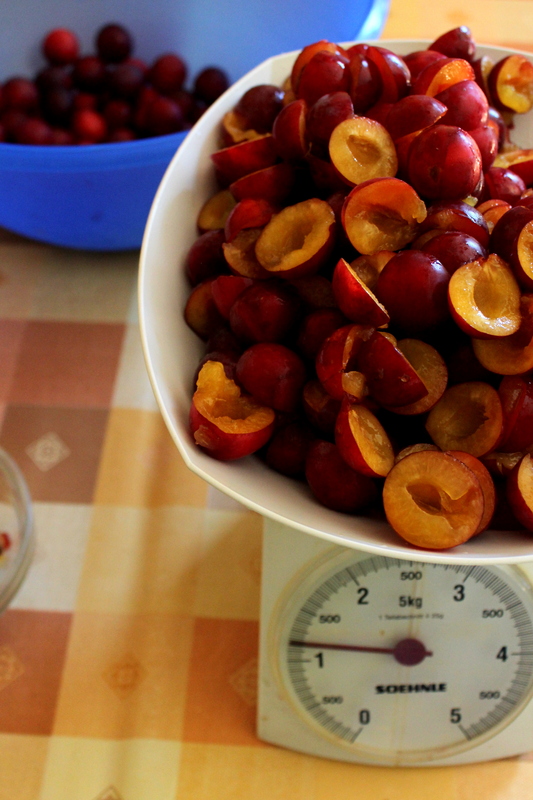 Weigh and measure – place prepared fruit on the measuring thing that probably has a name (a scale? I don’t know, I really don’t). 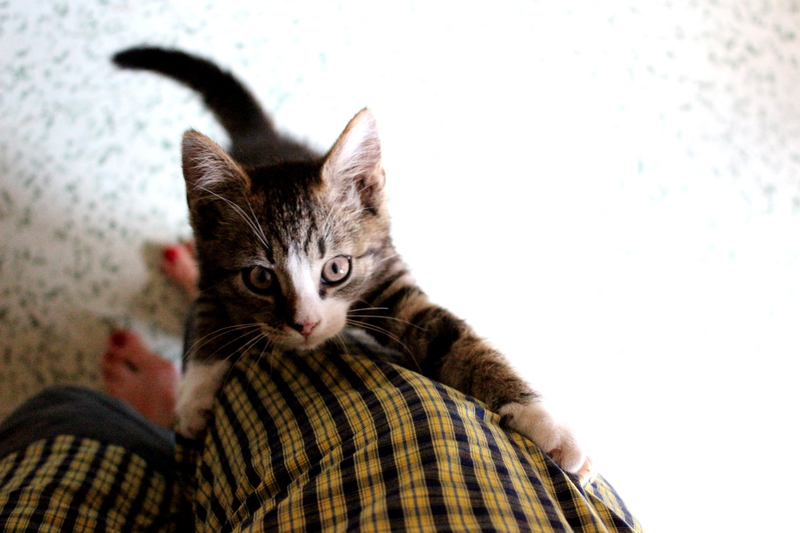 You will need roughly [this part is fuzzy because the kitten was chewing on a string and nothing else mattered at that moment] kilos of fruit to get [now the kitten is pouncing on it like a tiger] of jam. Pour ⅔ fruit into sauce pan – make sure to spill fruit everywhere possible to give the jam a nice “this has been on the floor” taste. Pet the kitten again. Stir on medium heat, add sugar – [Actually, take back that point about medium heat. Philip was managing the stove and although he probably said what to do…I remember none of it]. Pour SPECIAL, MAGIC, UNEXPLAINABLE SUGAR PACKET into fruit mixture that will help it gel. Heat. Stir. Pretend you’re cooking someone’s brains. 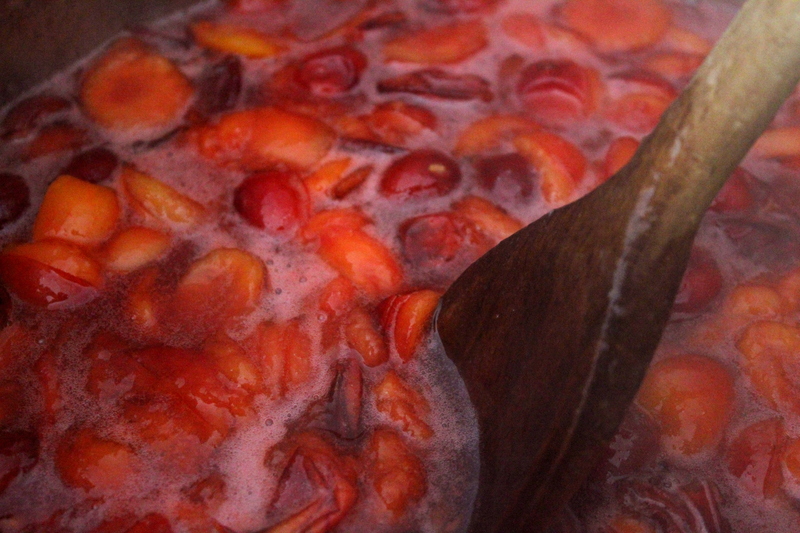 When mixture has cooked down, add remaining fruit – there was a reason for doing this. I forgot what it was. You will too. Blend – With a blender thingy, puree the fruit/sugar mixture until it looks like soup. But it’s not just any soup. It’s got the SPECIAL, MAGIC, UNEXPLAINABLE SUGAR PACKET. 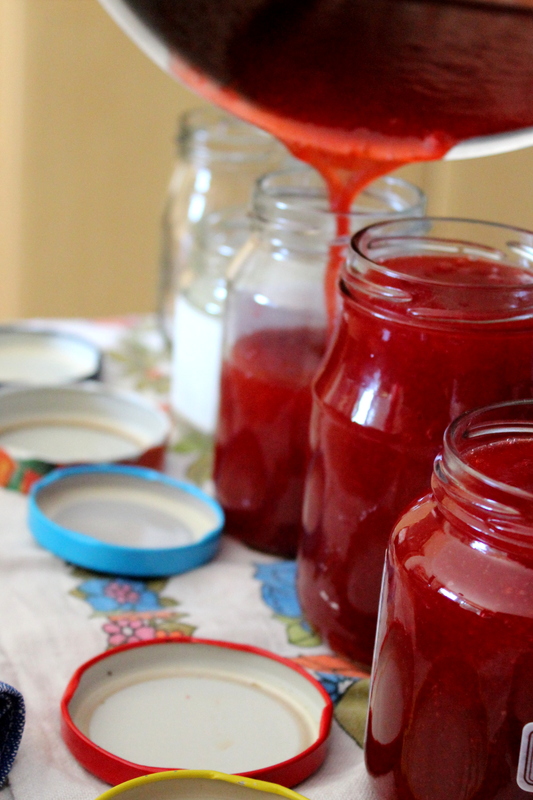 Let simmer and prepare jars – use clean (or unclean – your call) jam jars, preferably with lids that fit. Test the jam mixture on a plate or an area of the counter that you don’t mind being irreparably stained. If the mixture gels when cool, it is ready to be put in your jars. Pour mixture into jars – be careful not to spill on the counter, the floor, the kitten or yourself. Squeeze on lids and flip – once the lids are securely fastened (dude, that part is important. SECURELY FASTENED), flip the jars upside down so that they will [something about compression and pressure and suction] as they cool. 11. Finish! – pat yourself on the back, go pet the kitten, drink some tea. Whatever makes you feel like a success in the kitchen. Because you are! I was deliriously exhausted after a weekend-long illness and decided to make pineapple upside down cake. Because, of course. Jared lent emotional support and read all the Czech labels for me. What a friend. Here is the actual recipe because only part of the dribble I managed to scrape into a cake made it into the footage. Melt butter in a 9-inch baking pan in the preheating oven. Remove pan. Arrange pineapple chunks in a single layer over the butter and brown sugar, then sprinkle with pecans; set aside. Beat biscuit baking mix, white sugar, milk, vegetable oil, vanilla extract, and egg together in a large bowl on low speed for 30 seconds, scraping bowl constantly. Increase mixer speed to medium and continue beating until batter is smooth, about 4 minutes more. Slowly pour batter over the pineapple mixture. Bake in the preheated oven until a toothpick inserted into the center comes out clean, 30 to 35 minutes. Run a paring knife between the cake and the edge of the pan to loosen cake. Cover the cake pan with a plate, and invert it to flip the cake out of the pan and onto the plate. Cool at least 10 minutes before serving.